Wednesday, June 12, 6:30 – 9:30 p.m.
Join Inter/Micro and the State Microscopical Society of Illinois (SMSI) as they honor James Solliday with the 2019 August Köhler Award (venue TBA). James Solliday is recognized for his numerous contributions to light microscopy and active participation in microscopical societies. He was a principal founder of the Microscopical Society of Southern California (MSSC) in 1996 and is currently the MSSC president, a chair he has held every year since 2002. He is also a long-time contributor to the Los Angeles Microscopical Society, and a member of the American Circuit of the Postal Microscopical Society, Quekett Microscopical Club, and the International Society for Diatom Research. Mr. Solliday is well known for his extensive knowledge of microscope history. He assists microscope collectors worldwide and was the curator of the Frank Lundy Antique Microscope Collection, which was publicly exhibited at the San Francisco international airport. Mr. Solliday has taught workshops on diatoms, illumination methods, staining, photomicrography, microscope maintenance, and the history and identification of antique microscopes. 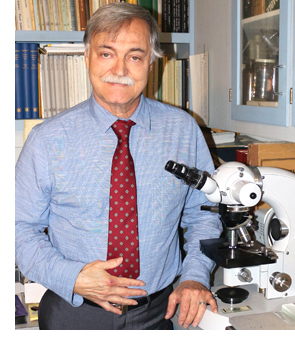 He has published dozens of microscopy articles, including contributions to the MSSC, San Francisco Microscopical Society, Los Angeles Microscopical Society, and The Quekett Journal of Microscopy. He was instrumental in obtaining and donating surplus microscopes to area schools, and has been a regular visiting lecturer to local classrooms. For 35 years, Mr. Solliday has operated his own business called Educational Photo Lab, which specializes in photomicrography. He has produced photomicrographs for Hollywood movies, documentaries, litigation exhibits, contamination analysis, authors, Ph.D. students, and publishers, with more than 450 microscope images published in textbooks. Beyond the micro world, he served for 31 years as a professional firefighter and medical technician for the city of Costa Mesa, CA. The cost is $80. Register and pay online or complete the fillable PDF attendee registration form for fax or snail mail.